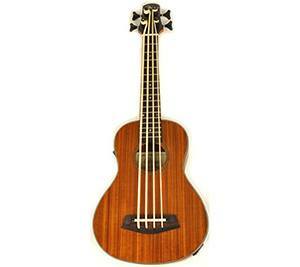 Ukulele bass instruments are, essentially, smaller versions of standard bass instruments. They’re easier to play, they sound pretty much alike, and they’re often cheaper. Now, there are quite a lot of differences between regular basses and ukulele basses, but there are also a lot of similarities. For example, the design of both ukulele and standard basses looks pretty much the same. Uke basses are somewhat shorter, but the outward appearance is quite similar. The sound is very similar too, only that standard bass instruments sound quite deeper. Now, for the major differences. The strings equipped to ukulele basses are often plastic, nylon, or flat-wound metal, while the standard bass strings are made almost exclusively from metal. The materials, the hardware, and such are also unique to each category. Most people only look at the price, but there are a lot of things you should take into consideration before you buy your bass. For example, does it come with any complementary features? Some Uke basses come standalone, but some manufacturers add bass ukuleles picks, gig bags, cables, and more. Complementary features are always a plus. Furthermore, you should always check the quality of material used in the manufacturing process, the type of strings, and the dimensions of the ukulele bass. The list is quite long, but we can put it like this: make sure the bass is made from high quality materials (mahogany, rosewood, maple, etc. ), and that the strings are good for your skill level (nylon and plastic for beginners, for example). Beginners tend to struggle with the process of re-stinging a bass ukulele. Hadean’s Acoustic Electric Bass UKB-22 NM is one of the earlier models from the UKB series. It’s very popular because of its traditional outlook and design, and because its sound performance is great overall. This instrument boasts a fine durability rating – it’s built from exceptional, sturdy materials that include the zebra wooden body and the rosewood fretboard. This electric bass comes supplied with a preamp. The preamp serves to magnify the power of midsection, the treble section, the bass, and volume. The UKB-22 NM comes outfitted with a set of Italian Aquila Nylgut ukulele strings which will allow you to tune your instrument with great ease. They seldom go out of tune, and they’re considered to be very precise. One of the best features about this bass ukulele is the integrated tuner that further simplifies the tuning process. Since the Aquila strings provide enough sustain, all you need to do is strum each string, wait for response of your tuner, and use the machined heads to tune in each string. 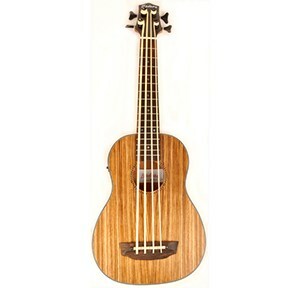 All in all, Hadean’s Acoustic Electric Bass ukulele UKB-22 NM is a great uke bass model. It’s not cheap, but it’s not too expensive either, it features a traditional design, and it’s very durable. Considering the performance - the Italian Aquila Nylgut ukulele strings provide an excellent sound output - you might want to consider this model if you’re searching for a bass ukulele. 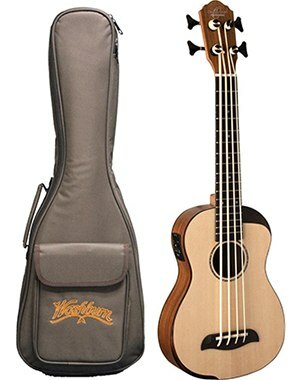 Kala’s UBass-EM-FS is ideal for people who want their Ukulele Bass to perform and look beautiful. It’s an electric acoustic bass which you can wire up to your amp to amplify the sound – the input is found on the right side, just below the strings. Kala’s UBass comes in two material and color variants – exotic mahogany (EM), and spruce (SSMHG). Each model variation sounds different due to the differing materials used. You’ll have a solid Uke bass if you play it acoustically (un-amplified). The strings are decently wide, but you won’t get the best out of Kala’s UBass this way. If, however, you wire it to your amp, you will get the sound that resembles the upright bass instrument. Kala’s UBass has definitely earned its place among the top 10 ukulele basses in terms of the outlook, the performance, and the well-balanced sound stage it provides. The only thing that you may not like is the price, as it costs more than average. Anyhow, it holds a great value for the cash. This bass ukulele is cheap when compared to other models we’ve reviewed so far, but it’s capable of going toe to toe with those more expensive ones. 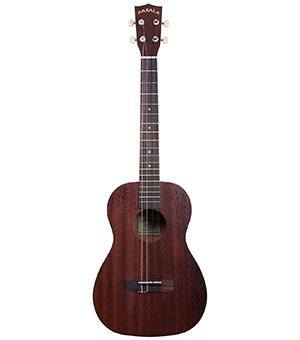 Kala’s MK-B Baritone Ukulele is a beginner’s baritone ukulele, as it’s practically weightless, the strings are not too tense (or too loose), and the play-ability is excellent. 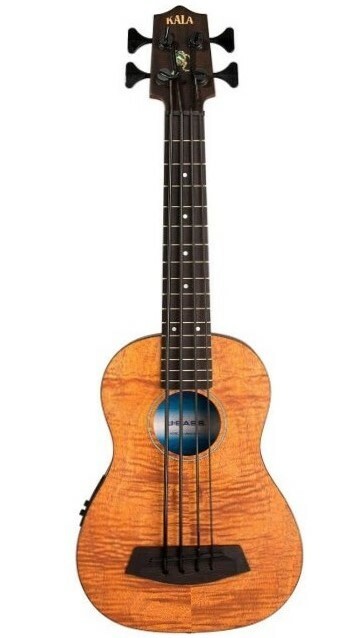 This bass ukulele is somewhat larger than a standard bass ukulele, but that won’t be a problem for a beginner ukulele musician (unless you want to play around with complex scales). Now, we must address the issue of play-ability. Most people are dissuaded from purchasing a cheap Uke bass mainly because they think that these instruments can’t perform too well. That’s not the issue here, as Kala’s MK-B Baritone Ukulele sounds amazing. The lightweight quality of this baritone bass is a big plus for beginners. You will want to readjust the position of your bass and your hands while playing, so heavier instruments tend to fatigue the player faster. Wrapping it up, Kala’s MK-B Baritone ukulele is cheap, it looks ravishing, and its play-ability is optimal. It holds an exquisite value for the price. Here we’re looking at another Hadean’s Acoustic Electric Uke Bass from the UKB series – the UKB 24. When compared to the earlier version (UKB 22), it features a few adjustments and improvements, but they aren’t substantial. Only for comparison's sake, we’ll state what the older features are, but keep in mind that both UKB 22 and 24 are phenomenal uke basses. Now, the first difference is in the material. The UKB 24 has a fretboard made of rosewood which is the same as the UKB 22. However, the body is crafted of swamp ash while the UKB 22 has a zebra wood body. Both UBK 22 and 24 models come with a special preamp setting that enhances the volume, midsection, treble, and bass. Again, both models use the Aquila Nylgut Italian ukulele strings which make the tuning easy and accurate. The last difference between the earlier model and the UKB 24 is the tuner. The UKB 22 features a built-in tuner as standard, whereas the UKB 24 comes outfitted with a Chromatic tuner which has an LCD display. Overall, Hadean’s Electric Acoustic UKB 24 is phenomenal, and it’s safe to say that it’s a step up in comparison to the UKB 22. Hadean’s Acoustic Electric Ukulele UKB 23 is the last Hadean’s Uke bass we’re going to review. This one is so good that it simply needed to be on the list. Now, Hadean’s UKB 23 Uke bass has the same design and outward appearance as its predecessor, but it features a beautiful mahogany body. The deep mahogany colour makes swamp ash look pale in comparison. It’s safe to say that Hadean’s Acoustic Electric Ukulele UKB 23 might be the most attractive bass in the series. This model also comes with the preamp feature. You can connect this electric acoustic bass to your amp and magnify the volume, midsection, treble, and bass to get a full-spectrum sound that resembles that of an upright bass. The use of Italian Aquila Nylgut ukulele strings is common with nearly all models from the UKB series, so it’s only obvious that the UKB 23 uses them too. These strings are (as we’ve mentioned before) some of the best on the market, and they provide enhanced accuracy of the fret intonation. Hadean’s Acoustic Electric Ukulele UKB 23 comes with an integrated tuner that allows easy tuning – simply strum the strings and use the tuner as a guide. UKB 23 is moderately expensive, but there are instruments in this category that cost a lot more. This model holds a great value for the cash. Luna’s Uke bass is made of various materials which are responsible for its durability and for its amazing outward appearance. You might’ve probably guessed, but the “TAT” stands for the “tattoo”-like design on the body of this ukulele. This bass has a solid performance, but most people like it for it's looks. The construction of Luna’s Uke bass TAT features a mahogany body, a spruce top, and the rosewood fingerboard. All of the hardware is black, which only adds to the overall beauty of the Luna TAT. As for the performance, Luna Uke bass is tuned a whole octave higher when compared to the standard ukulele models. This is the reason why the strings are thin and made of flat-wound metal. The sound performance of Luna’s TAT is extraordinary, and it’s safe to say that intermediate-level players would benefit the most from this model. 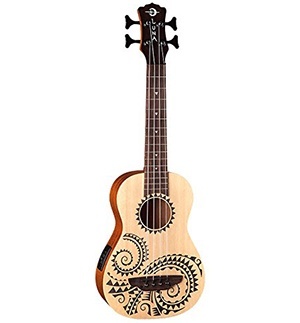 It can’t be considered as a cheap beginner’s bass ukulele, mainly because people who’re new to this instrument tend to find it pretty hard to play with metal strings (when compared to nylon or plastic, of course). Luna’s TAT is an electric acoustic uke bass that can be played unplugged, or plugged into an amp device. The price of this bass is nearly inexpensive, meaning that it’s not exactly cheap, but it’s definitely not expensive. As we’ve mentioned already, this is not a beginner’s bass – the strings are pretty dense and hard, but they sound amazing. TAT holds a magnificent value for the cash. 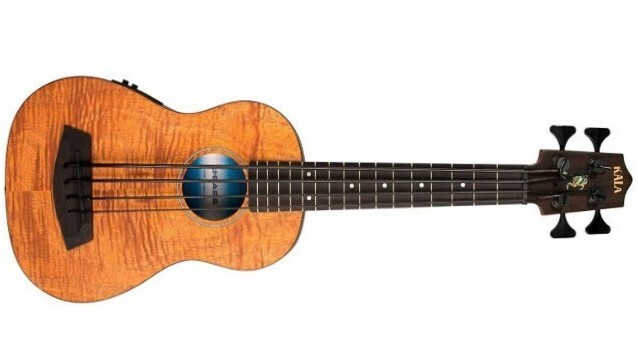 Oscar Schmidt’s Comfort Series Bass Ukulele is a high-end acoustic electric bass uke. It’s made of durable materials, and it’s pretty beautiful for an uke bass. The solid wood body features an interesting asymmetric design and a neck through body construction. The rosewood fretboard feels gentle under the fingers, and the hardware makes tuning easy. This Uke bass comes with a set of plastic strings – this could be a pro or a con, depending on your skill level. Now, plastic strings don’t exactly sound too good, but they make playing easier. This means that people with some skill won’t benefit too much unless they re-string their Oscar Schmidt. Beginners, however, would love this model as they would appreciate the easier action. Anyhow, even those newest to this kind of instrument tend to spend a lot of time getting accustomed to this ukulele. Oscar Schmidt’s Comfort Series Bass Ukulele comes with a complementary gig bag which is a great addition to this remarkable bass. The only problem about this instrument is that it costs a lot. It’s a high-end uke, sure, but you should consider it only if you’re prepared to pay top dollar. It’s worth it, though, only it’s not exactly affordable for everyone. 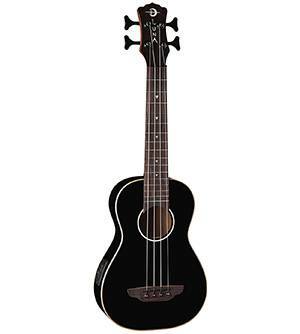 Plainly speaking, Luna’s black bass ukulele looks ravishing. It features a full-black design (except for the fingerboard), with black body, black hardware, black neck, and black head. The baritone body design is remarkable, and the high gloss finish will make you love this magnificent piece of art. The top of Luna’s black bass ukulele is crafted of Spruce, the back and the sides are made from premium-quality mahogany, while rosewood is used for the fretboard. These top-end materials provide this instrument with a remarkable level of durability, all the while making it really quite beautiful. Luna’s black bass is supplied with a set of flat-wound strings that aren’t too good for beginner’s but intermediate players and more seasoned players would benefit greatly. This Uke bass costs quite a bit, but it’s definitely one of the best-looking instruments that money can buy. Check out this cute video for a quick review and to hear this Luna Bass in action! So, you’ve seen our top 10 picks of bass ukuleles, now you just have to decide which one is the best for you. There are premium-quality beginner ukuleles and there are high-end uke basses for people who want the very best. If you're looking for something with a higher quality than a beginner bass, but are not really looking for a top of the range model, there are always some ukulele basses in the golden middle. These are the ones that boast high value for the cash and optimum performance level. Since these 10 models range in price and skill level, it's hard to say which one is “the” best, but you can rest assured that we picked those with the highest potential of being “the” best of the best in the category you are in the market for.